When you see how the village is situated it’s hard to argue with the name. 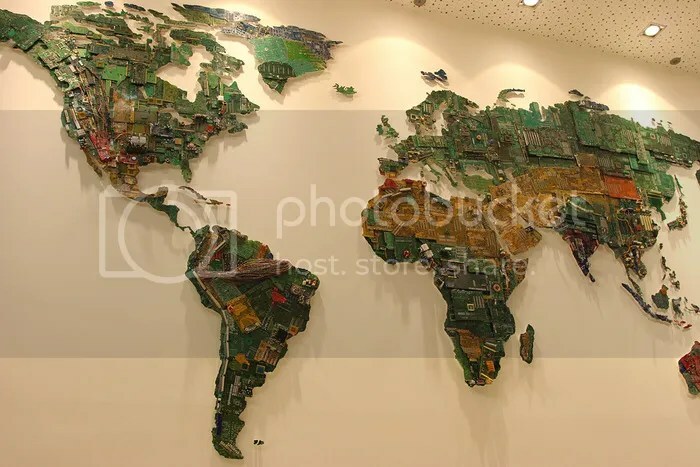 What better way to represent the world today than with the computer parts that connect us? This world map was created by UK artist Susan Stockwell for the University of Bedfordshire. As you can see the piece mimics the colour and relief of the world’s landforms. I particularly love the bundle of cables linking the Andes with the Amazon delta. Alas, she omitted Vancouver Island and Haida Gwaii, both of which are much larger and more populated (and much more beautiful!) 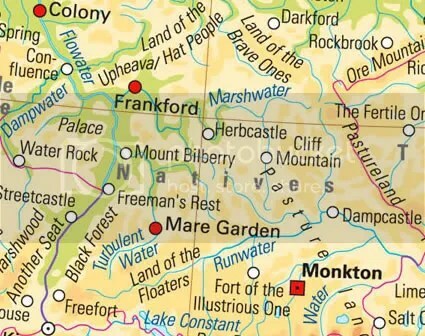 than many of the other islands depicted on the map. It happens a lot, unfortunately, so perhaps she was working from a faulty model. In any case it’s still a beautiful map. You can see more pictures at technabob and on Susan Stockwell’s website. Greetings from From the Cowford Island! The clever people at Kalimedia have combined two of my favourite things, maps and etymology, to create the Atlas of True Names. What’s they’ve done is to translate place names into plain Anglo-Saxon English. I’m not sure how they came up with “Northland of the Home Ruler” for “Canada” (which is usually thought to derive from the Mohawk word for “village”), but I can definitely see how “Vancouver” means “From the Cowford.” I don’t think the tourism people will be putting that humble bit of trivia on the brochures. I didn’t find out it was Geography Awareness Week until today, but since maps are one of my favourite things I thought I’d post about it anyway. The event is sponsored by the National Geographic Society and is aimed at improving geographic knowledge, particularly among Americans, but we can all participate regardless of, well, geography. Mid-way through the week was GIS (Geographic Information Systems) Day, which celebrates digital mapping. I started working with GIS more than ten years ago, and I’ve been very pleased to see GIS coming to the internet in recent years. The most obvious manifestation of this is Google Earth, but many government agencies are also putting vast geographic databases online for people and businesses to use. Many of these web applications not only let you view geographic data, they allow you to create, annotate, and share your own maps. For anyone who likes maps, these are good times. And for the classically inclined, you can also view digital maps of the past online. Check out Google Earth’s Ancient Rome 3D layer. Happy mapping! 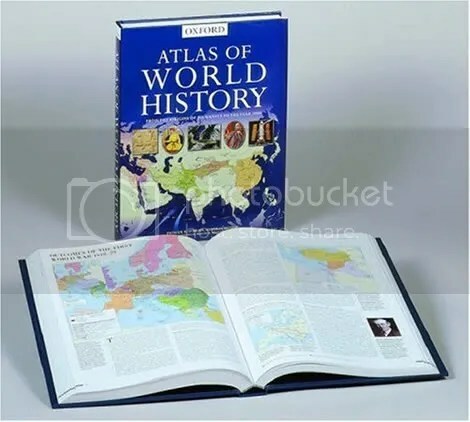 One of the (few) downfalls of my two world history textbooks is the lack of maps, at least for ancient times, so you see I just had to purchase the Oxford Atlas of World History to get the lay of the land. This magnificent cellulose confection tells me, among other things, that the lapis lazuli that was made into cylindrical seals (the precursors to writing) by ancient Sumerians came from the western Himalayas. That’s a long way to go for pretty blue rocks! And consequently, so is the 12-pound, 560 page Oxford Atlas of the World. This was another of amazon’s 70%-off Boxing Day specials; I can’t believe I got something so monolithic for a mere $60. It almost doesn’t seem right. It’s the deluxe edition, no less, with the sturdy slipcase, and a 6-month subscription to Oxford Reference Online. I am in awe. It may seem strange to get so excited by an atlas but I’ve always loved looking at maps, air photos, and satellite photos. Throw a depiction of the earth’s surface at me and I’m happy. Well, unless it was printed before the fall of the Berlin Wall, as was my old Britannica atlas. It was long past time for an upgrade. As an added bonus, amazon also had the Oxford Satellite Atlas of the World on sale (not received yet but, like it or not, you’ll probably hear about it when it gets here). As for the maps, they are very readable, with larger type and simpler contouring than my old Britannica atlas. The downside of this is that in particularly crowded areas, namely Europe and parts of Asia, it has fewer place names than the Britannica. 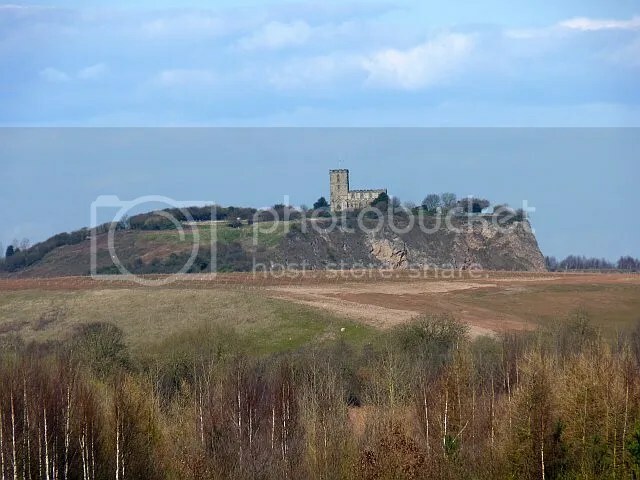 Of course that is assuming that the tiny villages depicted in the Britannica are still there, which is a big assumption after 20 years of continued urban migration. The Oxford is nothing if not up-to-date, and will be revised every year. Of course there are debates about which atlas is best. 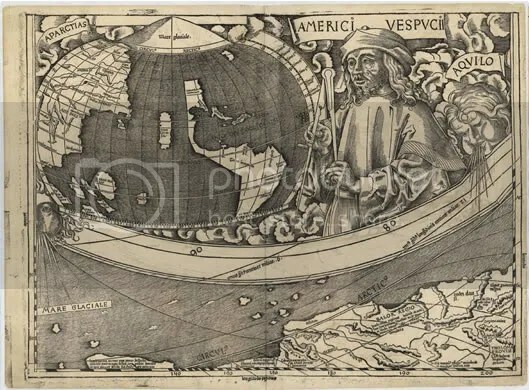 National Geographic has extremely detailed U.S. maps, but most of the comparative reviews I’ve read pick Oxford for world coverage (including good North American coverage). 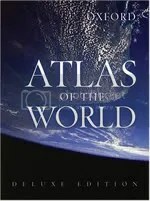 If I wanted complete coverage, however, I would go for the OED of atlases, the Times Comprehensive Atlas of the World. Unfortunately the price tag is too steep for mere recreational use, but I’ll be keeping my eyes open next Boxing Day. Now. Where am I going to put this thing?? Here’s a blurb about the Oxford atlas at the OUP (US) Blog.